Like those first disciples, we may find that Jesus suddenly turns to us and asks, "Who do you say I am?" Our answer can make all the difference in the world..
“And who do you say I am?” Jesus asked. 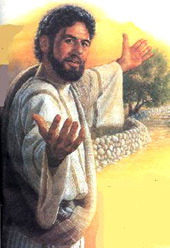 Peter spoke up, “You are the Messiah.” And he forbid them to tell anyone about him. He called the crowd, together with his disciples, and said, “Let those who want to become my followers deny themselves and take up their cross and follow me. “For those who want to save their life will lose it, and those who lose their life for my sake, and for the sake of the good news, will save it. What’s the profit in gaining the whole world if you lose your life? After all, what could they give you in exchange for your life? 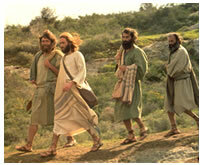 While traveling with his disciples Jesus asks them about The Word On the Street. He wants to know what people are saying about his message and his ministry. In response, the disciples share the most popular opinions. There are those who see him as a prophet: a God-inspired truth-teller who was sent to call the people back to faithful living. Some — including King Herod — believe Jesus to be a reincarnation of the slain John the Baptist. Others think he might be Elijah, whose return was said to herald a new beginning for the kingdom of Israel. Jesus was not being dismissed or ignored — not after the miracles he had wrought! — but there was no consensus. As far as most folks were concerned, he could be almost anybody. So far this sounds like a typical traveler’s conversation; a general topic of discussion for the long trudging hours on the road. Nothing important; just a way to keep boredom at bay. That seems to be the disciples’ attitude: no one gets excited, nobody’s pushing a particular opinion; it’s all casual and speculative. Some of them probably aren’t even paying attention to what is being said. I imagine that brought the group to a sudden halt — and one or two of the stragglers bumped into the ones who had stopped. There was confusion and disorder, “Stop, will ‘ya?” “What did he say?” “Shhh!” and moments of silence before Peter spoke up. In the meantime the disciples had to consider what had been asked of them. All at once (or, as Mark likes to say, immediately), without any warning, they were faced with the most important question of their lives. Did time seem to slow — and seconds feel like hours, while they pondered their reply? Or was it like a rushing wind — a sudden, hurried thing? What was the right thing to say? What was the honest thing to say? We know the answer didn’t immediately spring to their lips. There wasn’t a joyful chorus in response; no shouts of "Huzzah! You are the king, our Lord, and the Messiah." Only Peter answered. We don’t even know if they all agreed. We only know that they continued on their way. Of course we wise and well-schooled Christians know that if the Lord turned to us and asked, “Who do you say I am?” - we’d have a ready answer. As a matter of fact, we’d have a whole slew of answers. Scripture and religious traditions have provided us with many names and titles for Jesus: priest, prophet, and king; Prince of Peace; King of Kings; Lord; Messiah; Holy Teacher; Gracious Master; Christ; Son of God; Son of Man; Child of Wisdom; Radiant Healer, Divine Advocate, Merciful Judge; ... the list goes on and on. If we say that Jesus is “the Christ,” or draw on a phrase from the liturgy such as “Jesus is Lord,” or “our Lord and our Savior,” we may think we’ve answered the Lord’s question. But words are not reality: language can conceal the truth as readily as it can reveal it. What matters is what these words mean. But even taking into consideration the newness of the idea, or their limited theological language, it’s easy to scorn the disciples’ confusion and slowness in responding. Every morning of every day they stood in the Lord’s presence. They’d seen what he had done, they’d heard his words, and experienced his gracious love and holy power. How could they fail to answer immediately with a declaration of their faith and loyalty? Every morning we follow our daily routine: shower, shave, cup of coffee, blearily heading off to work. The day drifts along in a sea of business-as-usual. A coworker shows up late for a meeting, the copy machine has died, and the phone system is on the blink. At lunch a bicyclist darts past us on the sidewalk, a young mother struggles to quiet a fussy toddler, an elderly man fumbles with his change ahead of us in line. With true Christian forbearance, we do not shout or curse or shove. Our answer doesn’t define Jesus — it defines us. Our response to his question defines our relationship to the Lord. When we say Jesus is “the Christ,” we confess our belief in Him as Son of God, source of abundant life here and eternal life hereafter. When we call ourselves Christians we confirm our promise to be his disciples: to follow Him in all we say and do, in everything we hope for and believe. We reveal our understanding of “who Jesus is” not merely by what we proclaim with our lips, but in the testimony of our lives. When we are merciful and forgiving, caring and compassionate; when we bless and do not condemn — we are the living proof that his Gospel is true. Through our words and our works we, his disciples, are witnesses of the Lord’s power to nourish, to restore, to heal, and to save. Or we can serve as convincing evidence that Jesus was not who he said he was. 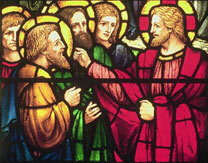 After Peter’s confession, Jesus insists that the disciples not tell anyone that he is the Messiah. This mandate to keep silent has been called “the Messianic secret,” which makes it sound as if Jesus wished to conceal his true nature. But I don’t think that’s the case. I believe that Jesus was cautioning his followers against glib, unfounded proclamations of who He is. By demanding our “silence” the Lord makes us take his teachings seriously; we can’t just spout a few platitudes about “loving our neighbors” and then go on about business-as-usual, despising those who are different, ignoring the welfare of the poor, the ill, and the aged. Simply telling others that Jesus is the Lord will be met with skepticism or outright denial. Words are not enough. It’s up to us to prove that our claim is true. 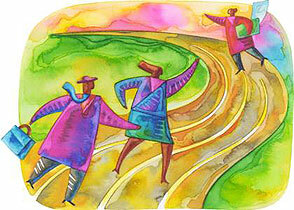 Give prayerful consideration to the question: Does your daily life reflect that the Christ is at work in you? image and text © 2009 Merriam-Webster, Inc.
Related Pages: The Lord's Prayer: Thy Kingdom Come, A Prayer of New Beginnings, About Rev. Deb. Or go: Home.